Royal Mail Advertising Mail and Business Mail Low Sort and High Sort services. There are some excellent postal discounts that can be achieved by using Royal Mail Bulk Mail (Mailsort) services. To achieve sizeable postal discounts, CPM pre-sort mail before presenting to Royal Mail. There are two levels of sortation, known as Low sort and High sort. 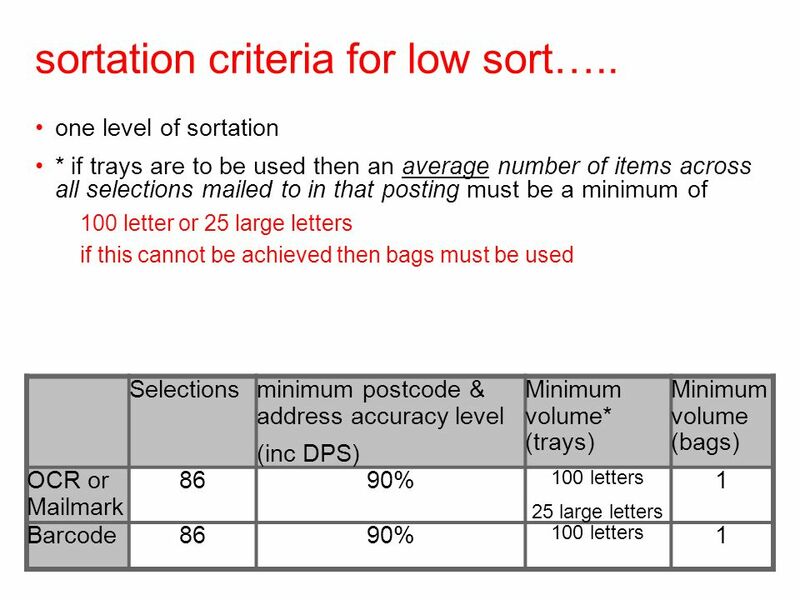 Mailings sorted to Low Sort level are sorted into 88 selection areas. High Sort mailings are sorted into 1525 selection areas. Sophisticated software is necessary to assign a selection area to each record in your database. This software also produces the computer planning report and list of selection areas (line listing) as required by Royal Mail. Letters for each selection area are all placed into the same bag or tray for distribution to the correct delivery office. Your mailing house can mail via your own bulk mail account if you have one or will mail via their own account. Payment for postage is required prior to despatch as postage costs are passed on. Advertising Mail is used for mailings which promote a product or service. Business mail is used for other types of communication such as change of address notifications, invoices, statements etc. Low Sort OCR – A machine-readable service, prepared to stringent Royal Mail guidelines so that it can be read by Royal Mail’s sorting machines. (Available for letters up to 100g and large letters up to 10mm thick and 750g provided that the mailpiece is flexible so pens, plastic cards or stiff drinks mats are not allowed). High Sort – a service used for mail pieces which do not meet the requirements of OCR and CBC services. 1st class is delivered within 1 – 2 days. 2nd class is delivered within 3 days. Economy class is delivered within 4 working days. Prices valid for mailings posted after 02/01/18. Royal Mail prices are expected to rise around January 2019. For mailings of 4000 items or more, please call CPM on 01902 402693 (office hours) for advice as we may be able to make further savings using Downstream Access (DSA). All postage prices assume that the total package weight is under 100 grammes. Advertising Mail prices assume that the primary purpose of the mailing is advertising. Prices do not apply to bill and statement mailings, magazine subscriptions or other non-advertising communications. All postage prices are subject to VAT at the current rate. An un-discounted VAT exempt service is available for non-VAT registered organisations. ASBOF levy has been included where applicable. Barcoded mail services may not be available for Business to Business mailings. Business Mail and Advertising Mail items must be produced according to strict Royal Mail guidelines. Skyrocket Your Business co uk are accredited to produce mailings to these guidelines earning you the maximum postal discount available for your mailing. Volume discounts are available on mailings of more than 10,000 large letters or 20,000 letters. Our one-stop service covers cost-effective design and print, printed envelopes, fulfilment and Royal Mail Bulk Mail discounts (Mailsort). Skyrocket Your Business co uk are accredited to produce OCR mailings. We are able to ensure that your mail piece meets Royal Mail’s entry criteria for Advertising Mail and Business Mail OCR and Barcode products. Advice is free so why not call us on 01902 402693. Alternatively, why not message us for advice on the best postal service for your mailing and how to keep your mailing costs as low as possible. Thank you for reading this article, which, hopefully, has proved useful to you. If you would like further advice on any specific aspect of leaflet production or direct mail, please feel free to message us. Or message us for help, advice or a quotation on your own project or requirements.